Serbia-born artist Marina Abramović loves testing her own limits—and ours. Early in her decades-spanning career, she helped pioneer the form now commonly know as “performance art" by subjecting her own body to a host of taxing and dangerous manipulations: standing atop a burning platform in the shape of a communist five-point star until she lost consciousness from the smoke; ingesting pills for people with nervous disorders that she herself didn't have; symbolically ending a 12-year romantic partnership and artistic collaboration with German performance artists Ulay by walking from one end of the Great Wall of China until she crossed her soon-to-be-ex-lover at the middle. More recently, she inspired Jay Z to perform the song “Picasso Baby" for six hours straight, and opened a Lady Gaga-cosigned, 30,000-square-foot “institute" in Hudson, NY, self-described as platform for “immaterial and long-durational works." From the start, her exploration of our psychological, perceptual, and bodily frontiers as humans has occasioned a parallel scrutiny of the parameters of art itself: when you create a work of art that hinges entirely on the movement of bodies in space, you're suggesting that art doesn't always have to be something you can physically grab onto. Abramović's work also entailed a disruption of the capitalistic smooth functioning of the art world: you can't “buy" a work of art that exists only for the duration of a performance, however many hours or days it may last. 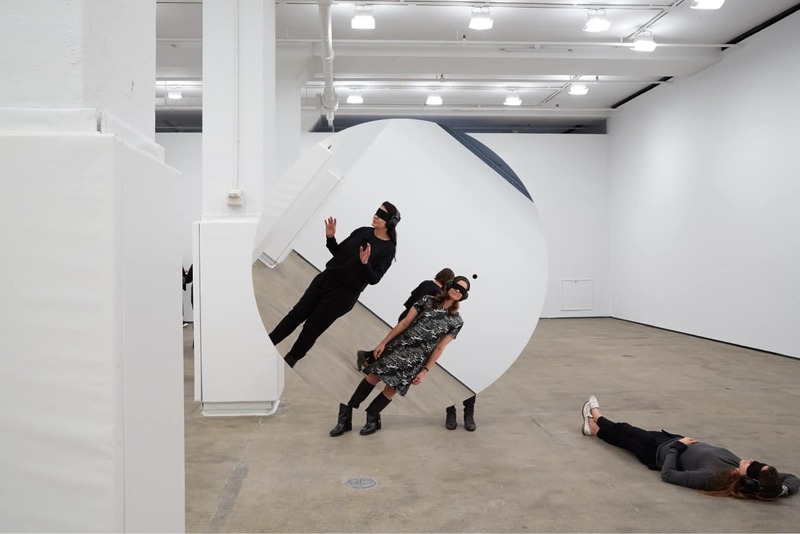 Until this Saturday, December 6th, New Yorkers looking to experience an Abramović work first-hand can haul it over to Sean Kelly Gallery for a new performance called Generator. It's the follow-up to 2010's The Artist Is Present—a three-and-a-half-month-long performance in which she invited participants to sit across from her at the MoMA and lock gazes with her, leaving nary a dry-eye in sight—and the artist is billing it as a career culmination of sorts. 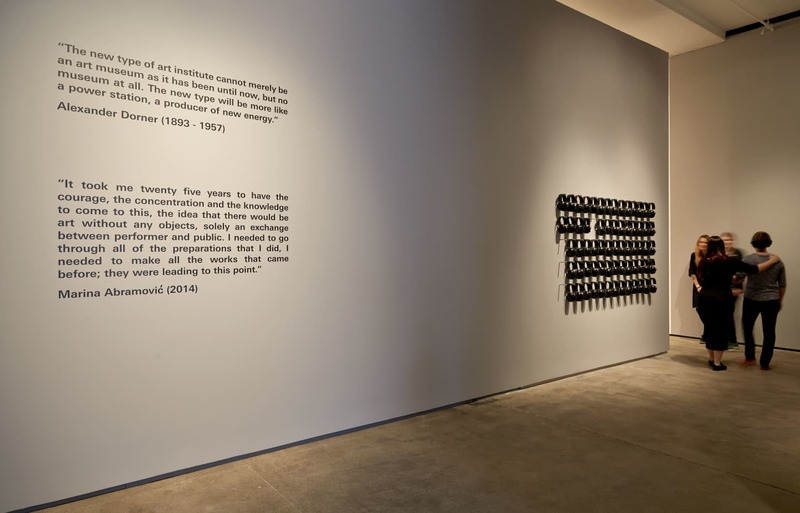 “It took me twenty five years to have the courage, the concentration and the knowledge to come to this, the idea that there would be art without any objects, solely and exchange between performer and public," reads a wistful-sounding artist statement about Generator at the entrance to the gallery. “I needed to go through all the preparations that I did, I needed to make all the works that came before; they were leading to this point." 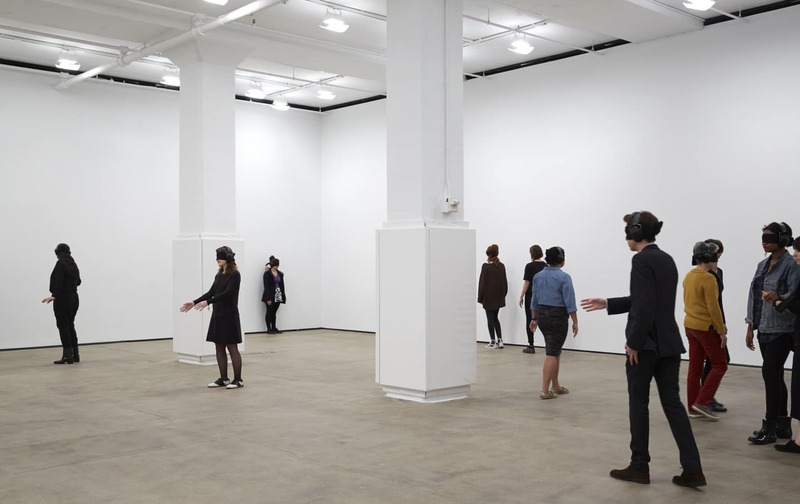 According to the press release for the exhibit, Generator is about “nothingness," “forced introspection," and the “production of energy and its transmission"; in practice, it consists in inviting a bunch of people to wander around an open room at the same time, blindfolded and wearing noise-canceling headphones. In this special edition of Social Anxiety, four FADER staffers offer a diary-style, play-by-play of their experiences. Unlike other installments of this column, it ended up having a lot to do with actual social anxiety. Full disclosure: I have some issues with spatial orientation. I once fainted in front of a date at the Hayden Planetarium, but despite that, upon arriving at Sean Kelly Gallery last week, I wasn't terribly anxious about having my sight and sound taken away for the sake of art. Emilie, Patrick, Steven and I had cabbed it over there together but wouldn't be leaving together, agreeing to take as much time in the space as we liked. I placed my iPhone in a locker, and walked toward a young women dressed in all black. She told me the rules: walk slowly; try not to make any noise; sit, stand, or lay down as you'd like, and raise your hand when you're ready to leave. Her tone was measured and gentle, like a mother saying “there, there." Then she placed a black blindfold and noise-cancelling earphones atop my head. When we started moving, the attendant's hand on my left arm, I was faced with the first experiential choice I'd confront inside Generator: lead or be led. If I stopped momentarily, so would she; when I'd shuffle forward, she would, too. Despite the blindfold, I found myself pulling her slightly. When it felt right, I slowed my stride until she was the first to stop. She let go of my hand and I stood still, head down. Because I had seen the space in gallery photos, I tried to mentally map my surroundings. I put my hands out in front of my body, and proceeded around the room at molasses-pace. Without sight, my steps were unsure; I imagined I looked like Bambi discovering his legs for the first time, shaky and cautious. The ego is sensitive like that: take away of two of my senses, make me feel vulnerable, and suddenly I'm concerned about the judgments of people I can't even see (and who, therefore, may not even exist). This was all within the first minute. I hope you brought a couch. My hands led me straight into a wall, which I followed until its end—another wall. I was in a corner. I slid down and sat there on a cool wooden floor. I wanted to think clearly about the experience and, well, wait. Perhaps for a moment of eureka. I wondered how Emilie and Steven and Patrick were doing, what they were thinking, if they were moving and if maybe we would bump into each other. If we did, would I recognize them? Would I know them by smell? I have no idea what they smell like and I've worked with them for years. I kept thinking about what I should be thinking about, when thumps or subways or gallery noise would jar me free of that spiral. Still, there was a seemingly long period where things felt pretty calm and quiet, and I started feeling sleepy. I wasn't thinking about much more than the stillness when someone, also following the wall, came close and grabbed my arm. Their hand went down my arm in a series of tight squeezes, before grabbing hold of my hand. We remained that way for a minute perhaps (although it was impossible to approximate time). I wondered if I should squeeze the person's hand back, or shake mine loose. I was uncomfortable—this was maybe a stranger, touching me, with people watching, maybe—but followed my own personal rule number one: stay open. When the person left, I sat still and unfocused until I forced myself back up and embarked back out into the blank space. I stopped after a brief navigation and stood still. Within minutes, I raised my hand to leave. A woman came to my side, grabbed hold of my hand and started walking. I led once more out of instinct, but slowed myself until we, in tandem, stopped. She removed my headphones first, then my blindfold. The light felt extraordinary on my eyes, sensitive from an hour-and-a-half of darkness, and I focused them on the attendant. Her gaze didn't break. This felt like the most impactful part of the exhibit. That connection—eye contact, specifically—was central to Abramović's The Artist Is Present. With Generator, she strips participants of the ability to connect with other people via the faculty of sight—only to make it more meaningful when it returns in the end. As far as I can tell, what we make of an exhibition like Generator speaks more to us than it does to Abramović herself. She's giving us the parameters; we create the experience. Why was I worried about who may or may not be watching me gather my sea legs in blindness? Why was it hard to let someone lead me when I couldn't lead myself? Why was I trying so hard to find thoughtful meaning in that room? Why did I want to do this in the first place? I know the answers to these questions because they're variations on a theme as far as my life experience goes. Generator just triggered them at all once. That's the mark of good art. Or maybe that's the meaning I'm applying to it. In general, my experience inside Generator felt playfully occultish—like some sort of old fashioned schoolyard game. I spent my first several minutes inside the space—five? ten?—creeping around the room, hands stretched in front of me until I bumped into a wall. I kept thinking, to an almost obsessive degree, about something one of the exhibit's attendants told me, just she before covering my eyes with a blindfold and placing the noise-cancelling headphones over my ears. “There's no talking" she'd said. “But feel free to walk around, sit down, touch things, and make friends." It was the last part that stuck with me, and seemed impossible: make friends. I didn't know who was in there with me: Was it just Emilie, Steven, and Jessica—people who I was familiar with and considered friends already—or were there other strangers roaming around? I stood in what I thought was the center of the room—I even sat down for a little—and half-hoped someone would run into me. At the same time, though, I was genuinely terrified of bumping into anyone else, of invading their space and potentially making them uncomfortable. I experienced fleeting meditative moments, but mostly I was fixated on that idea of making contact, which is probably why it only happened twice. At one point, I brushed what seemed like the sleeve of someone's knit sweater (Wasn't Emilie wearing a sweater?). It's strange, because I regularly describe myself as someone who “likes to be alone"; I've even rolled my eyes at or pitied the sorts of codependent humans who require near-constant interaction. 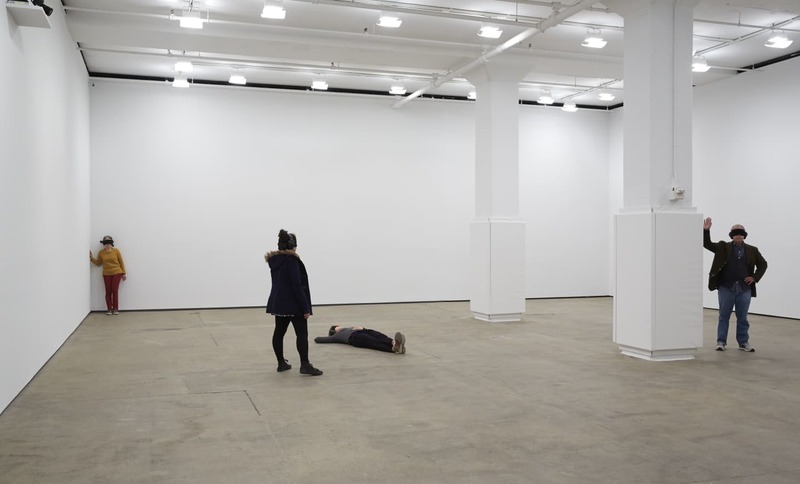 What does it mean then, I wondered, that I felt truly bored and lonely now, adrift in Marina Abramović's “nothingness," as the artist herself has described the show's focus. When I put my hand in the air, which we'd been instructed to do when we were ready to leave, I had a feeling I was going to be the first one of the FADER crew to split (I was right). As I sat there with my hand up—again conjuring images of elementary school—I was vaguely excited for when the attendant would come get me. It wasn't because I was ready to leave, to smoke a cigarette, to see the new Hunger Games with my roommate, as I'd planned to do that night. I wanted those things, yeah, but I was oddly looking forward to the silent, staggered exit with the attendant holding my hand, walking next to me, showing me the way, almost like a friend. The first thing I noticed while walking into Marina Abramović's Generator was my nervous smile, which reminded me of walking across a stage in front of a large crowd. Basically, I knew there would be at least one person eyeing me for the entire twenty minutes or so that I was there, timidly feeling my way around. I felt vulnerable at first, but began rationalizing; after three weeks working the show, the stoic attendants would probably be too jaded to take note of my singular clumsiness. After internalizing this, I felt more comfortable taking “risks," i.e., not holding the wall or peaking down the bridge of my nose to the floor. My grin slowly melted away. My understanding of the show, at least as an introvert, was how occasionally disengaging ourselves from certain sensory experiences—whether it be sight, people, or a certain type of music or food—can help us better appreciate and understand them. Taking off the blindfold and headphones in the end was a familiar high, not unlike seeing an old friend or listening to a favorite song you haven't heard in years. Marina Abramović's Generator doesn't entirely strip you the ability to see or hear—or at least, that's not how I experienced it. After the kind-eyed, soft-spoken lady in black clothes tightened the blindfold around my head, I could still peer downwards at the tip of my own nose, noticing the small crack of light that was illuminating it from beneath. I could also hear—not well, but enough to register the odd police siren blaring by outside, or the distant patter of high-heeled footsteps. On occasion, there even a loud, shuddering, boom, which I quickly realized was a sound that could happen when one of the faceless spectators walking around the exhibit unknowingly walked face-first into a wall. This, along with a soft, barely-there collision with another human being within my first few seconds of being left behind by my guide, was scary. The room seemed full of little threats—both animate and inanimate—and the little I could see and hear felt more like a reminder of how much I couldn't see and couldn't hear, how poorly prepared I was to successfully navigate around them. For the most part, I wandered around slowly with my arms outstretched—aware that at any moment I'd be making a collision with something or someone, wondering if I'd still feel surprised when I did. 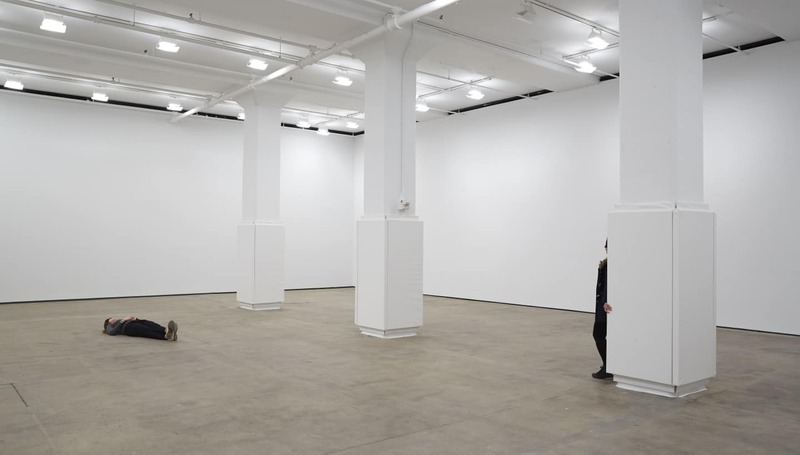 As it turned out, bumping into walls was actually more comforting than jolting, grounding me within the predictable, rectangular geometry of an art gallery on 36th street, enabling me to suss out its size by walking the length of one side, then another. Bumping into people wasn't. I didn't like getting my hand stepped on when I sat down on the floor at one point, hoping for some reason to meditate (how could I?). And I especially didn't enjoy the two or three times when I was the one inadvertently crashing into or stepping on others. More than being on the receiving end of an unwanted touch, the prospect of touching someone else without his or her permission was the part of the show that rattled me the most. Each time it happened—and it did, several times—it set off all my shame and embarrassment buttons, making me wonder why I felt so weird about a happening that was simply the result of having a body and taking up space in a room. For the most part, that's what I ended up thinking about during the 30 or so minutes I spent inside the gallery: how Generator, for me, was less about being alone with one's own thoughts than about holding a magnifying glass to the ways in which we instinctively relate to other people, and how co-existing with other people has a lot to do with trust. Entering a room full of strangers—mostly blind, mostly deaf, and a lot more defenseless than you are on a typical day—requires a certain blind faith in the fundamental goodness of the world. You've got to trust that nobody there is out to hurt you, and also trust that everybody there trusts you. Still, if there was anything particularly eye-opening about the experience for me, it was the discovery of how an environment so full of threats could ultimately be very gentle. For all my anxieties about the other people in the room, the collisions—aside from the getting stepped on part—were all soft and timid and momentary, reminding me each time that everybody around me was probably feeling just as vulnerable and tentative as I was. By the time I finally decided to raise my hand so that a guide could come retrieve me, I was also grinning with a realization about my own behavior in the room: I'd been frightened sometimes, but I couldn't resist the temptation to move around and explore, like a child discovering the world for the first time, blindly running into obstacles and then quickly bouncing back. Generator had prompted its fair share of introspection, but something about that realization—that of my own innate curiosity, as a human—felt bigger than me. Images courtesy of Sean Kelly Gallery.